We carry a full line of Aeromotive Fuel Pumps and Fuel Regulators for Marine applications. 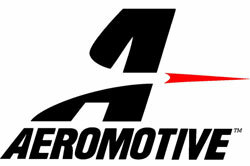 If there is an Aeromotive product you are looking for, but not in our website, give us a call and we can special order it for you! CNC-machined and adjustable from 5-12 psi, Aeromotive 2-Port Fuel Pressure Regulators are an excellent upgrade from the competition. Ideal for carbureted and dedicated nitrous applications where higher flow and quicker response is desired. Re-seats after needle shuts down to prevent pressure creep. Mounting bracket included. For those of you unfamiliar with boost referencing of a fuel system, well it's the ultimate way to meet fuel supply demands on a supercharged engine. By connecting a hose from your intake manifold to the top fitting of this regulator you can control fuel pressure on demand. You see for every pound of boost your engine generates it will allow the regulator to increase fuel pressure by the pound. These features have been used by professional race teams for years. P/N 13204 provides (2) ORB-06 outlet ports and 1/8' NPT gauge port. EFI conversions will require a larger-than-stock return line for proper low pressure control. NOTE: REGULATOR DOES NOT INCLUDE THE FITTINGS SHOW IN THE PICTURE. FITTINGS SOLD SEPARATELY. The new A1000 Bypass Regulator was designed specifically for high horsepower EFI engines. The all billet construction and boost reference capabilities matched with the 1000 Superpump make for the most powerful fuel supply system you can buy. The new A1000 Bypass Regulator was designed specifically for high horsepower EFI engines. The all billet construction and boost reference capabilities matched with the 1000 Superpump make for the most powerful fuel supply system for your EFI engine you can buy. This regulator provides quick response and high flow for your high performance engines. Aeromotive billet aluminum, adjustable marine fuel pressure regulators are specially designed for carbureted marine applications. Aeromotive marine fuel pressure regulators provide the quick response and high flow that your high performance engine needs. They're perfect for nitrous applications! The regulators re-seat after needle shutdown to prevent pressure creep and they're adjustable from 5-12 psi. They feature a corrosion-resistant black anodized finish, a 1/8 in. NPT gauge port, and a mounting bracket, 3/8 in. NPT inlet/outlet ports. They are designed for gasoline applications.